After 24 days and 23 different head-to-head matchups in our inaugural Best of Android Reader’s Choice award, Android Authority‘s most passionate readers have spoken. With an incredible 650,811 total votes cast, you have definitively told us your pick for the best smartphone of 2018. 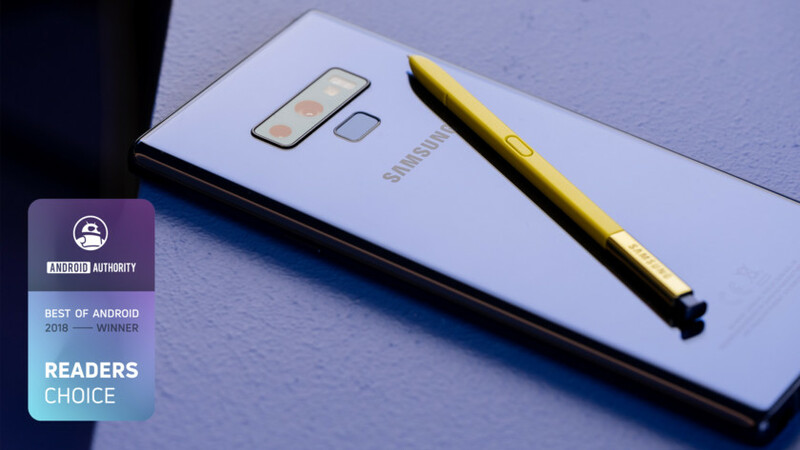 The Samsung Galaxy Note 9 has taken out the coveted Android Authority Best of Android 2018 Reader’s Choice award! The Galaxy Note 9 not only vanquished a field of awesome phones in our testing, making it our pick for the best smartphone of the year, it's also a crowd favorite. Given the epic response to the Reader’s Choice competition, you can bet we’ll be back next year to do it all again with a whole new batch of phones, the first of which we’ll see launched at CES 2019 in just over a month. While we have to admit there are some pitfalls to choosing a phone based on a semi-convoluted popularity contest, there’s no doubt you guys had as much fun with it as we did, with tons of great comments, likes and shares. From the bottom of our hearts we want to thank you for making the first Best of Android Reader’s Choice award a resounding success! Interestingly enough, our objective testing and Reader’s Choice competition turned up the same top three results, which was a little bit of a surprise. That lets us know our updated scoring algorithm is very well-tuned, sufficiently so that this year our objective data matches up with your subjective experience. It’s not every day the facts match the feels! When both our internal scoring and our readers agree not just on one thing, but three things, the results are pretty compelling. We’re really happy with how our awards process turned out this year. If you’re looking for great phones, we’ve got you covered on all fronts. We learned a lot about not only our readers, but the devices they love. Many popular phones didn’t make it very far this year. Some unfortunate devices had the misfortune of running up against a highly-seeded phone at the outset and exiting the competition early, but such is the luck of the draw. These things happen in tournaments, as any sports fan can tell you. In another bracket, the OnePlus 6T probably could have made it to the finals. But it had the distinct misfortune of having the fifth seed in our polling, which put it in the same bracket as the Samsung Galaxy Note 9. It delivered some of the most crushing punishments in our matches, dumpstering both the LG V40 ThinQ and the RED Hydrogen One. However, sometimes you just can’t beat certain opponents. If you look at the voting split, the OnePlus 6T actually fared better (43.99 percent) against the Note 9 than our other eventual finalist, the Huawei Mate 20 Pro (43.09 percent) — now that’s impressive. A first round exit is always a shame, but when two phones with technically-impressive components aimed at niche audiences go head-to-head, there’s always an enthusiast darling left out in the cold. This time it was the Sony Xperia XZ3. While its fans were loud, they weren’t numerous enough to keep the handset alive through the first round, bowing out to the HTC U12 Plus. Perhaps the most interesting part of the voting was just how overwhelming the Instagram vote was. Voters on the platform didn’t often break with the rest of the Reader’s Choice polling, but when they did, they were the ones that decided the winner. The consistency in voting across platforms was actually a little surprising, but it only further serves to reinforce the overall result. Instagram saved the HTC U12 Plus from the Sony XZ3, and it rescued the Xiaomi Mi 8 from the Honor Magic 2 (unfortunately we were not able to get ahold of the Mi Mix 3 in time for Best of Android). Beyond that, it merely cemented the results of the other platforms. Grasping the scope of 650,811 votes is a little difficult, so I decided to frame it in terms that might be a little more relatable. If Android Authority readers were citizens of a US state, they would have eclipsed the vote totals of thirteen other states in the union this November. In total, more votes were recorded in our Reader’s Choice competition than ballots cast in Maine, Idaho, West Virginia, Montana, Delaware, Alaska, Hawaii, New Hampshire, North Dakota, South Dakota, Rhode Island, Wyoming, or Vermont for the 2018 midterm election in the United States. Sure, that’s a fairly low bar to clear, given our voters had 23 opportunities to have their say, but let us have our day in the sun. We know the rules were different and the comparison is totally unfair — hush you, we’re having fun. Of course, not everyone will be happy with the results (we’d love to hear your ideas for improving things next year), but we wanted to say one final thank you to all of you for making this year’s Best of Android event so fun. I’m very honored to write for you all, as is the whole AA team. I hope you stick around for next year’s event because we’ll be cooking up some fun new features in the meantime.